The most common way to edit a value source is with the inline value source editor, which allows creation of value sources using simple expressions. Text string string "my text string", "\"string with quotes \""
Rather than providing a comprehensive list (that would soon be out of date), I suggest looking through the examples and edit those of interest to see the expressions that are produced for them. Also, you can build a complex value source using the Advanced Value Source Editor and then inspect the expression created for it. Note: not all value source configurations can be converted to, or parsed from, an expression string. 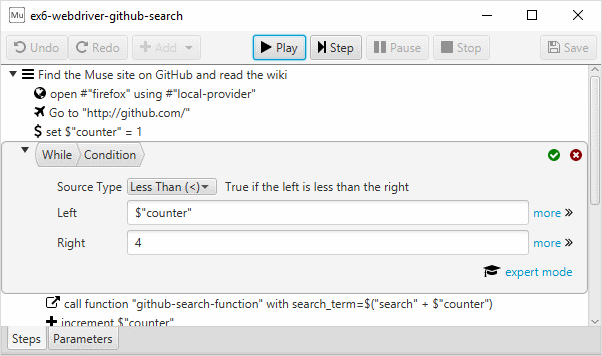 When value sources are edited inline or within the step editor, they are editable using value source expressions (when the step and value sources allow it). But they can also be edited more directly, with the more link beside the inline editor. As described in the Muse Framework docs, value sources are composed of other sub-sources and/or a raw value (quoted string, integer, true/false or null). This editor allows you to choose the value source type and set the sub-sources. In the advanced editor, you can see that it is a Less Than value source, which contains two named sub-sources, left and right. If you further expanded the left source, you would see that it is a variable value source that contains a single sub-source (type string), which contains the name of the variable to be used. Note that value sources can have sub-sources that have sub-sources and so on. They can be nested arbitrarily deep. Use the expert mode link to switch to Expert mode. The expert editor allows configuration of parameters in a very general way. While it enforces a configuration that is coherent with the underlying data structures, it does not enforce a configuration that is valid for the specific value source. This may cause unexpected behavior - use at your own risk. Refer to the value source documentation for the valid sub-sources. The Getting Started Guide demonstrates the command-line documentation tools.